How to load custom controls in MiniToolBar? You can load custom controls in MiniToolBar by following the steps. 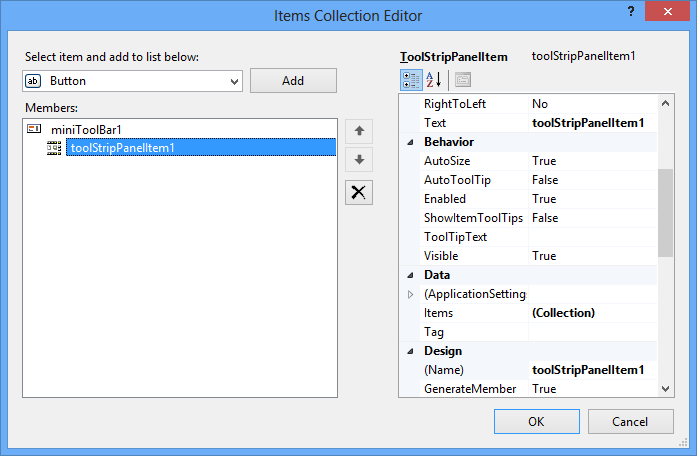 Need to add the ToolStripPanelItem in MiniToolBar Items Collection Editor, as shown in below image. Figure 1. Item Collection Editor for MiniToolBar. Need to host Custom control as ToolStripItem and add it in ToolStripPanelItem. Need to add the ToolStripPanelItem in MiniToolBar. Specify the associated control for MiniToolBar.